Second Pride 2012 is coming up, and we can do a lot to help! Please ask the organizers Doc Spad or Kharissa Indigo for information. The Pride will have six sims full of attractions, events and shopping opportunities. Two event sims in the middle will be surrounded by four retail sims. The organizers are looking for interested builders, sponsors, dj's etc. This is a good chance to show what you can do, to big audiences, as well as to give for a good cause! 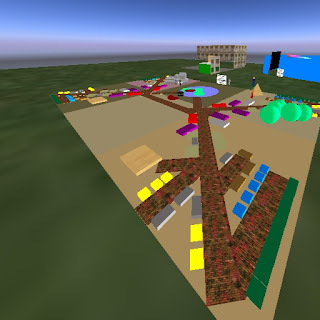 Builders contact Doc Spad, 2012 Second Pride Chairman inworld or via email at docspadusmc@gmail.com. Dj's, bands, clubs, groups, etc, contact Kharissa Indigo, 2012 Second Pride Events Chairperson. Second Pride festival will be offering free space for LGBT advocacy and support groups in Second Life. Please contact Doc Spad. Press: A Photo packet will be available during the week of May 7th, and before that, the organizers will be able to bring photographers in the work spaces to take their own pictures. Contact Doc Spad. You can visit the Mock-up of the festival area to see the planned layout. Sponsors can reserve spots by paying the color boxes, and clicking them to give name of business. The bigger and more expensive spots are closer to the event locations and walkways, of course.